Tops Gallery is pleased to present Material Will: Force In Form an exhibition of new work by Memphis based painter Dale McNeil. This will be McNeil's first solo exhibition at Tops Gallery. The artist offers 19 paintings and works on paper which explores his fundamental material's appetition to form. To produce these works the artist employs a self referential process that begins with degraded photocopies of unique works as a basis for a new image. The decomposition of one image is crucial to the birth of another. Both random and planned actions are used in equal measure to manifest an obscure organization of esoteric symbols veiled by layers of distortion. The result is painted form compromised by disorder and struggling for definition. The works offer few clues to the original source material, allowing the paintings to exist in a transformative state. 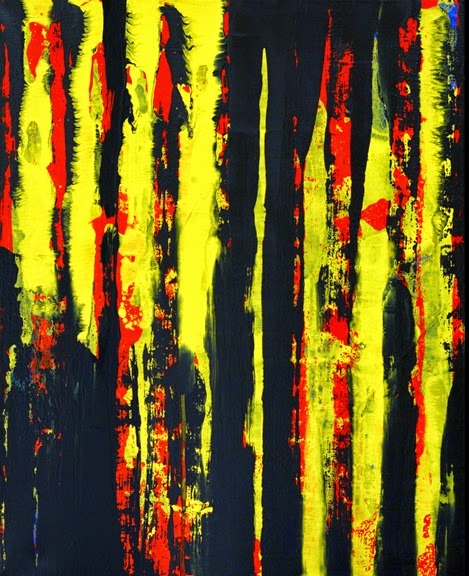 The dominant palette chosen for these paintings consist of deep blacks coupled with pure, intense colors. The palette along with the paints rough gestural surface illuminates a densely distorted and symbolic vocabulary. Fraught with formal and psychic tension, the paintings remain a static painterly spectacle. Dale McNeil's work has been recently included in exhibitions in New York City, across the United States and abroad. He currently lives and work in Memphis, TN.